Make a grand romantic statement with our Grand Romance floral arrangement in a hatbox. 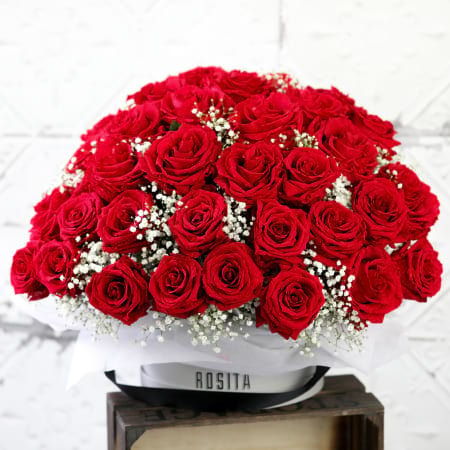 A stunning composition of our Red Colombian roses with baby`s breath, delicately arranged into one of our signature hatboxes. Surprise your loved one with an amazing romantic gesture that is sure to delight and enchant your beloved. "The red rose embodies the deepest meaning among all the rose colours - it is the universal symbol of love, romance and affection"